For those of you who have been following my blog from the beginning, you'll know that I'm a tad addicted to scrubs. Facial scrubs, body scrubs, foot scrubs... if it's a scrub, I'm going to want to try it out. There have been a huge trend of beautiful body scrubs on Instagram lately, and when I was contacted by Me, My Body & I Body Scrubs to ask if I wanted to trial out one of their scrubs, I jumped at the chance. As a local Melbourne company, I was pretty excited. 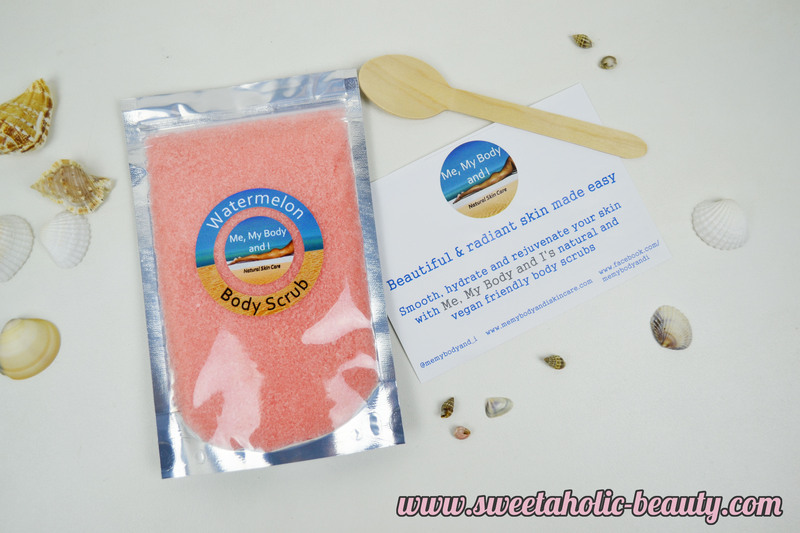 I was lucky enough to receive their super popular Watermelon Body Scrub. I was pretty happy with this, as I love anything that smells of watermelon. My scrub arrive extremely quickly (I suppose that was to be expected though, seeing as though they live in Melbourne) and safely. I could already smell the amazing watermelon scent from outside of the packaging. I love the design that the scrub comes in; this is a resealable plastic bag which means it's easy to travel with and keep in your shower. It also comes with a cute little wooden spoon so that you can scoop your scrub out easily. Although using a scrub is pretty much idiot-proof, it came with a really handy little information card.This told you a little bit about what's in the products, what kind of skin conditions the scrub can help with and other important information. I was also pleased to read on this card that the Me, My Body and I scrubs don't contain any preservatives or harsh chemicals, which means a bag will stay fresh for a few months. The scrub itself as pretty gritty and rough, which is how I usually like my scrubs - especially body scrubs. I had a bath and used this all over, and my skin felt incredibly soft and smooth afterwards. I did a bit of a naughty and used this directly after shaving, even though the card does warn it could cause irritation, but luckily my skin was fine. I've used it a few times since without the shaving, and I've been really impressed with how nourished my skin felt afterwards. I don't have any major skin issues, aside from a fair bit of uneven skin tones (being a chubby gal, that happens) so I wasn't keeping my eyes open for any miracle changes or anything; but my skin felt soft, rejuvenated and just all around nice after using it. I do get a little bit of acne on my arms (seriously don't ask why - I have no idea) and I found that after using the Me, My Body and I scrub, I was definitely seeing a decreased in my acne. 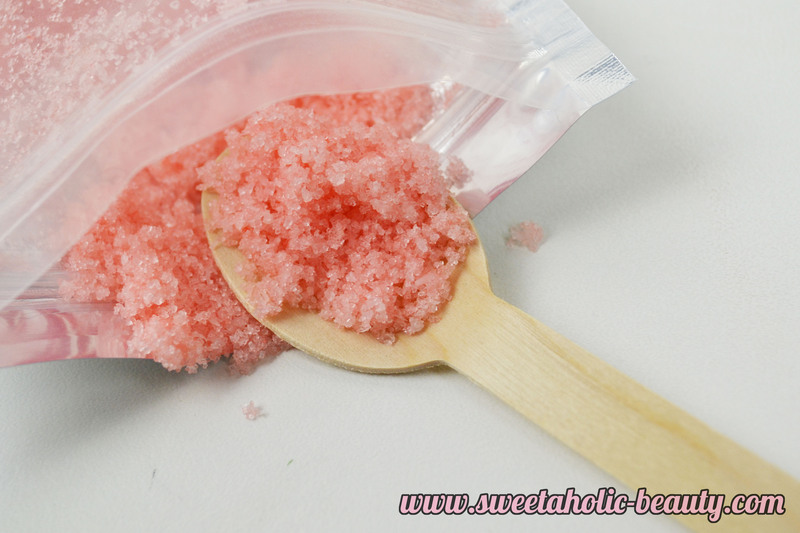 This was not only fun to use, what with the cute little spoon, but really helped make my skin look gorgeous. The package says there should be enough product for about 5-7 scrubs, depending on how much you use. I've used it about 4-5 times and I still have plenty left, but that may be because I am spot scrubbing problem areas. I'm totally impressed with the Me, My Body and I Body Scrub, and will definitely be buying more in the future. I'm really keen to try out the other scents; Strawberry, Pineapple & Mango, Black Raspberry & Vanilla, Coconut & Lime and Coffee. They all sound amazing and are all vegan. 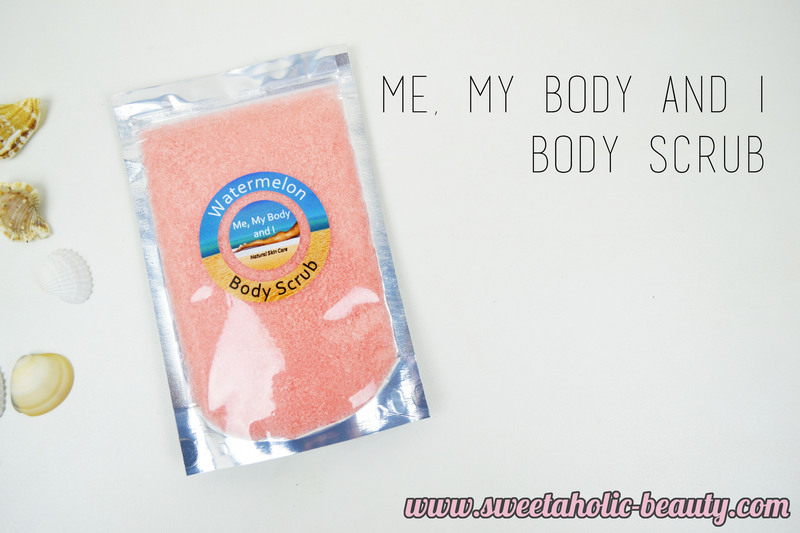 You can buy the Watermelon Me, My Body and I Body Scrub on their website for only $20; which includes free shipping within Australia. This product kindly provided for consideration. I love the sound of this scrub! Body scrubs are always needed in my bathroom. ooh, that does sound lovely! I'm loving the sound of this, and the other fragrance combinations sound lovely, too. So cute with the wooden spoon! This sounds delicious! I love a good scrub but I tend to favour things that are easy to use and don't create much mess!